As the brotherhood grew, Francis spent most of his time in deep prayer and meditation. Traveling with his companion Leone, Francis called him the Lamb of God. Leone documented their journey together. Leone was a true man of God, always searching, yet always tempted of earthly ways. Leone needed Francis to keep him strong despite his faithfulness and love for God. Francis was ultimately the strongest. The brothers referred to him as Father Francis. 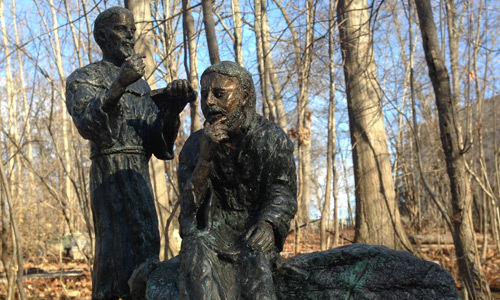 Francis believed one needs only a true heart in God when giving up so much…ultimately food. Francis and his brothers needed each other. Francis was an ailing little man who took nourishment from his faith and joy in God. His brothers needed Francis’ spirit to continue to walk them along the righteous path. This kept his faint body on earth longer. Francis in turn fed their souls with God. Mentre la confraternita cresceva, Francesco trascorreva la maggioranza del tempo in profonda preghiera e meditazione. Viaggindo con il suo compagno Leone, Francesco lo chiamava Agnello di Dio. Leone documento il vaggio. Leone era un vero usmo di Dio, sempre in cerca, ma sempre tentato dai modi terreni. Leone aveva bisogno di Francesco per mantenersi forte nonostante la sua fedelta e amore per Dio. Francesco era il pui forte. I fratelli si riferivano a lui come Padre Francesco. Francesco credeva che si ha bisogno solamente di un cuore vero a Dio per rinunciare a tutto, perfino al cibo. Francesco e i fratelli avevano bisogno l’uno dell’altro. Francesco era un nomo malaticcio, che si nutriva della fede e gioia in Dio. I susi fratelli avevano bisogno dello spirito di Francesco per continuare il cammino sulla guista via. Cio mantenne pui a lungo in vita il suo corpo debole. Di ritorno, Francesco nutriva la loro anime con Dio.